I like Silvia Tolisano’s early assertion that there is a difference between a Skype call and a Learning call. As we are so often reminded, it is not the technology that is important but the learning that is enhanced by it. And of course, Skype isn’t the only video conferencing tool that the learning activities described could have utilised. Everything Tolisano describes has soundly constructed learning design as its foundation. From the activation of prior learning – the subject of the calls, the tools to be used, to what is to be done with the tools (tweeting, photographing, videoing), to feedback and reflection. Assigning the various roles made for a truly collaborative activity, not just a group project. The activities were scaffolded for the students – for example rehearsing asking questions by recording them was a great way to build confidence. If working (and communicating beyond face to face interaction) on a global team is/will be a crucial skill for our students to posses, how can we assess the skills, support, coach and guide students? One of the biggest barriers to connected learning (for some teachers) is the “stickiness” of traditional assessment forms. Tolisano is bang on the money saying that new assessment forms cannot be additional, they must be upgrades or preferably replacements. This has lead to the creation of the Taxonomy of a Skype Conversation, a valuable tool for reflection and perhaps aspiration – What sort of conversation do you want to have? What sort of conversation is the best to listen to? etc. It is difficult for me to imagine how the teacher-learner interactions needed to guide the learners in these examples could take place digitally for such young learners. Yes, they learn a great deal from the person they Skype, but they are learning much more from the scaffolded activities taking place within the physical classroom (and online) with a teacher able to guide, instruct, coach and cajole. Could this happen with a distributed online classroom of third-graders? I don’t think so. Miller’s reflections included examples of online conversations leading to hands-on art and craft activities. The digital and physical work together for formal and informal learning activities. Tolisano and Miller both use their online connections to support and inspire what goes on in their physical classroom and library. A fourth-grade teacher was persuaded to post her student’s book-trailer on a blog which led to it being viewed by the author herself and the subsequent Skype activity. Knowledge networking made it happen. 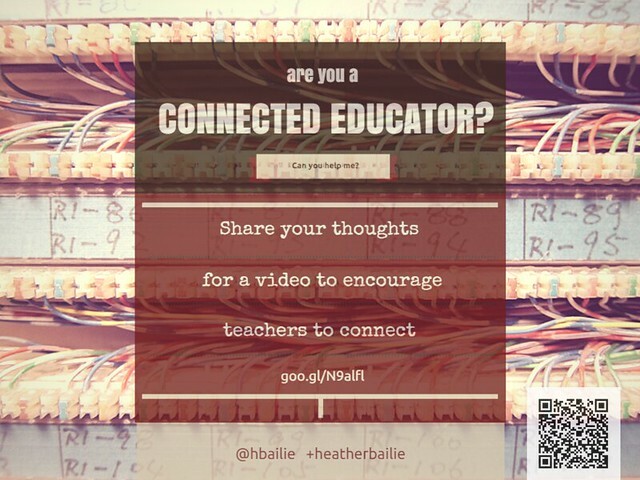 Get connected with Google+ is a short video for teachers promoting the value of using social media for connecting and developing a Personal Learning Network (PLN), showcasing Google+ as one option for a starting point. It can be viewed as a standalone resource but I envisage it being used as an engagement strategy for a face-to-face or online workshop for teachers. or similar requests in Google+ communities, on LinkedIn, Facebook groups and a couple of email lists. If you were one of those people, thank you very much for your contribution, it was almost overwhelming! The information shared helped me plan and construct the video and I’ve directly quoted more than twenty people. The video was created using several freely available tools: Powtoon; Screencastify; Audacity; i-Rig audio recorder; free music from Youtube Creator Studio audio library; royalty-free, no attribution required images from Pixabay, and edited with Windows Moviemaker. The first version of the video was edited after feedback was sought and received from a number of the original survey respondents – again, if that was you thank you for your time and honesty. The construction, purpose and effectiveness of the video has been further examined in an exegesis. This document includes a full reference list, links to the summary of survey results and the tools used. My artefact for assignment one will be a video titled “Get connected with Google+”. A video targeted at teachers who do not identify as Connected Educators, primarily for my own school but not specific to it. The video will firstly explore the value of becoming connected through quotes and data from teachers (crowd-sourced through Twitter, Google+ and Teachmeets) and theory from literature. The second part will demonstrate the use of Google+ as a non-threatening starting point for developing a PLN. Google+ has been selected as it is part of Google Apps For Education and offers flexibility in connecting and sharing within user-defined groups (circles) and specific interest communities. Using Google forms I have set up a survey which I have been sharing widely on Twitter, Google+, Facebook, Google groups and to email communities. It can be filled out from here too – please do! I didn’t know it till this week but it seems I’m an entrepreneurial learner. I look for new ways to do things, seek new resources, re-evaluate, re-assess, tweak, try, and reflect. I’m not happy doing the same thing in the same way unless I know there isn’t a better way (and that’s rare). So John Seely Brown’s words right at the start of the video struck me straightaway. That’s it! That’s my passion! I want other teachers to be entrepreneurial learners too. I want to be able to use the right language to convey my passion, to be able to articulate in pedagogical terms why it is important to keep up and to back up what I say with compelling examples from research. I read widely and find myself nodding my head in agreement or protesting “no” at an outrageous assertion but lack the skills to articulate why I respond that way. I need to “level up” my academic prowess. This is key in my motivation for study and I’m already being rewarded by the range of information being shared formally through the module and the new eye with which I’m viewing information shared informally. Teachers I work with get bogged down in real and imagined barriers relating to workload, red tape and previous bad experiences, using them as excuses not to try. I love seeing the lightbulb go on when someone realises that a particular tool can actually make them more efficient (seen recently with a new Evernote convert) but often teachers lack motivation or are scared of breaking something or admitting they don’t know. I want teachers to find the same joy I do in play. As Seely Brown says “a key aspect of play is…permission to fail. Fail, fail, fail, then get it right”. SAMR can be applied equally by teachers thinking about how they teach and how they themselves learn. I want to be an agent of redefinition. Finally, I need to become a better teacher-librarian by sharpening up my own search and research skills. Already I am enjoying the challenges this poses.